French: Carouges à tête jaune; German: Brillenstarling; Spanish: Tordo Cabeciamarillo, Tordo Cabecidorado. 9-10 in (23-25 cm); female 1.5-2 oz (42.5-56 g), male 2.6-3 oz (72.5-85.5 g). Sexually dimorphic in color. Males black, with a bright yellow head, throat, and breast, black between the eye and bill and on the chin, and a large white patch on the primary wing coverts. Females are brown above, with a golden yellow throat and stripe above the eye, and heavy brown streaks on their breast; in worn (summer) individuals, the yellow is paler and somewhat brighter. Young birds resemble females, and males in their first summer resemble summer females. 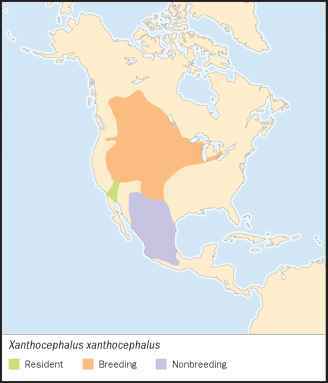 Breeds from eastern British Columbia and the Canadian prairies, east locally to southern Ontario, and south through the American west to eastern Washington and California, south to northern New Mexico. Resident in the lower Colorado River valley, and locally in south-central California. Winters from central Arizona, New Mexico, and western Texas south to central Mexico. Freshwater marshes, with cattails, tules, or bullrushes. In migration and winter, found in agricultural fields. Territorial during the breeding season. Males defend a territory with songs and chasing. Males perform a "song spread display," in which the wings are held up in a V as they vocalize. Both sexes perform a display in which the wings and tail are partially spread, the head turned, and the bill pointed upward. In winter, found in flocks, often enormous ones that contain several different species of blackbirds as well as European starlings (Sturnus vulgaris). Forage low in vegetation in a marsh or on the ground. Their food consists of invertebrate animals (especially insects), grain, and other seeds. Males commonly are simultaneously paired to up to six females; females are not monogamous, and will solicit copulation from males other than their principal mate. Females build the nest, which is a bulky cup of woven vegetation, commonly woven to several stalks of emergent vegetation in marshes. Three to five eggs are laid in May-July. Incubation 12-13 days; fledging at about 12 days. Usually single brooded, but replacement clutches may be produced. Not threatened. Yellow-headed blackbirds are common, and data indicate that their numbers are stable.